Agency Power Pulley - Crank Pulley - Pann Auto Performance - San Diego largest aftermarket automotive performance parts - What do you drive? 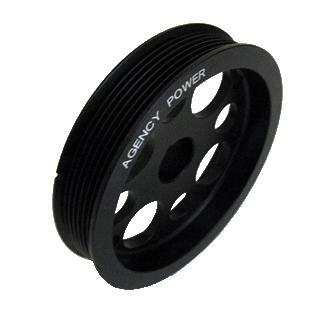 Agency Power Crank Pulley’s are CNC machined 6061 aluminum. Properly broached and includes the timing mark for a balanced OEM quality fit. The pulleys are then media blasted for a satin inish and lasered with the Agency Power name. Our Agency Power pulley weighs about 3.5lbs lighter then the factory pulley. PERIOD! I have used these on both of my Scions, and I love them.